A rivalry over two decades in the making reaches its climax when Undertaker and Triple H meet one-on-one for the Last Time Ever. Ronda Rousey teams up with The Bella Twins to face The Riott Squad. The ongoing vendetta between Samoa Joe and AJ Styles comes to a head in a No Disqualification, No Count Out, There Must Be A Winner Match for the WWE Championship. And The Shield reunites for a Six-Man Tag Team Match against Braun Strowman, Dolph Ziggler and Drew McIntyre. Plus, more! The Superstars of RAW and SmackDown head across the globe for Australia’s biggest sports-entertainment spectacular, WWE Super Show-Down! 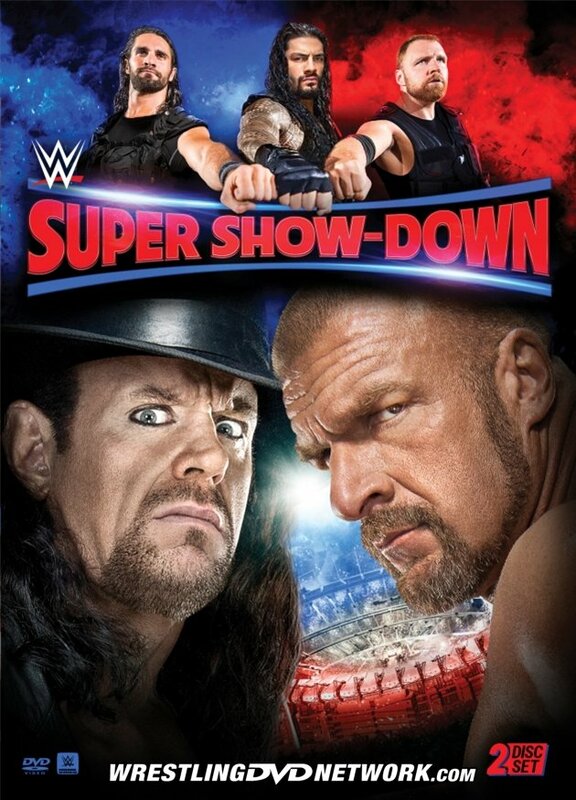 Last weekend WWE went down under for arguably The Biggest WWE Live Event Ever in Australia with Super Show-Down 2018 and you can add the spectacular to your DVD collection this time next month on November 13th in United States ($13.79; Amazon.com) and less than 2 weeks later on November 26th in the UK (£19.99; Amazon.co.uk). 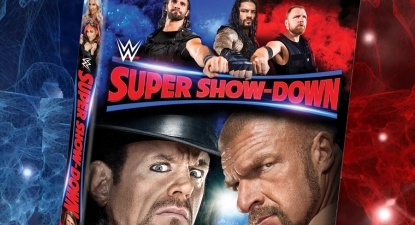 The Super Show-Down DVD, as is now the norm for the PPV releases, will be formatted as a 2-disc set in order to accommodate the complete event and a selection of extras. Included will be the full 4-hour event recently held in Melbourne, Australia that featured Triple H and The Undertaker going at it for the Last Time Ever (one-on-one, that is), the in-ring return of John Cena, a WWE Championship contest between Samoa Joe and AJ Styles, a SmackDown Women’s Championship contest between Charlotte Flair and Becky Lynch, The Shield taking on Braun Strowman, Dolph Ziggler and Drew McIntyre, and even more memorable bouts on top. Here at WrestlingDVDNetwork.com we just got hold of the DVD’s full content listing and its extras – those feature a collection of five RAW moments in the build up to Triple H vs. The Undertaker, including appearances by Shawn Michaels. We’ve also received the front and back cover artwork too, so let’s take a look! – United States: November 13th. 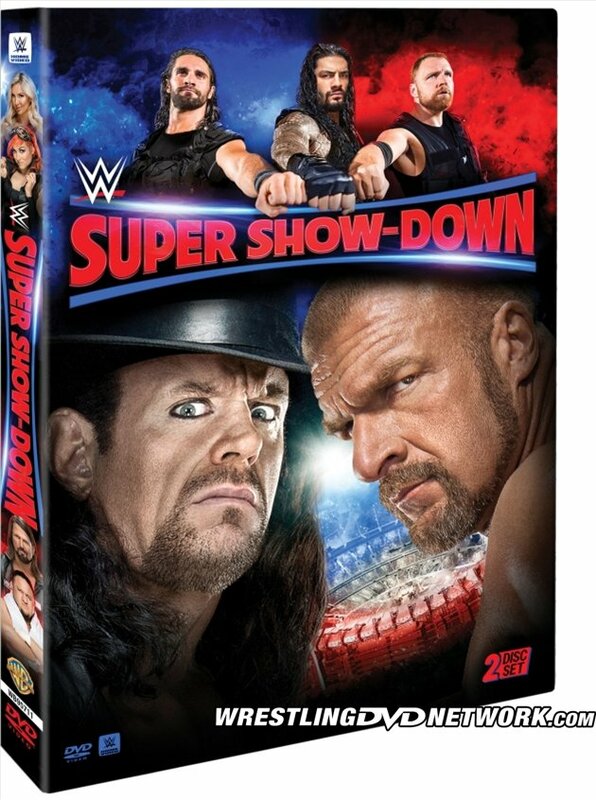 Get your Super Show-Down 2018 DVD here on Amazon.com. – UK/Europe: November 26th. Pre-order your Super Show-Down 2018 DVD on Amazon.co.uk. – Australia: November 28th. Get your Biggest WWE Event Ever on DVD via Madman.com.au.